James Morey Hockey was a painter and etcher who was born in 1904. 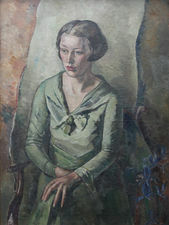 He was elected Royal Society of British Artists in 1940 and Royal Institute of Painters in Oil in 1940. He lived in East Dulwich in 1927 and Surrey in 1935. He exhibited at Manchester 2, New England Arts 2, Royal Academy 1, Royal Society of British Artists 2, Royal Institute of Painters in Oil 2.